The governor of Durham Prison has defended the jail's regime after figures showed it had the highest suicide rate in England. 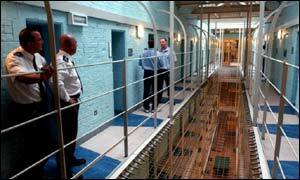 In total 13 prisoners committed suicide at North East jails in 2002 - six of them at Durham. Holme House in Stockton-on-Tees had the second-highest suicide rate, with five prisoners killing themselves while in custody. Durham's governor Mike Newell described the deaths as " a conundrum", but said prison staff were doing everything possible to prevent further deaths. The Howard League for Penal Reform, which produced the figures, blamed the suicides mainly on prison overcrowding. Frances Crook, director of the Howard League, said: "This level of suicides is not acceptable in a civilised society." The suicides at Durham are a particular concern because none were recorded at all in the previous two years. Mr Newell said: "If we knew the answers to what causes suicide then we could apply solutions. "The problem is that we do not. "It is incredibly complex and there are issues like mental health and drugs which play a part. "What we are trying to do is run a decent prison where problems are tackled and people feel safe in this environment. "Things have changed in that there are more prisoners in custody and with that comes overcrowding and pressures on staff. "We have put more and more effort into trying to give support to prisoners who may harm themselves. "It is a conundrum as we have actually reduced incidents of self harm by 14%." In England and Wales 94 prisoners committed suicide in 2002, the majority being males aged between 26 and 30. "We have been concerned about the number of prison suicides"